This year the cherry blossoms were just starting to appear so it looked much different. I like this picture that I took on my way to the hotel from the Limousine Bus stop. You can see one of the many Tokyo canals in the background of this picture. 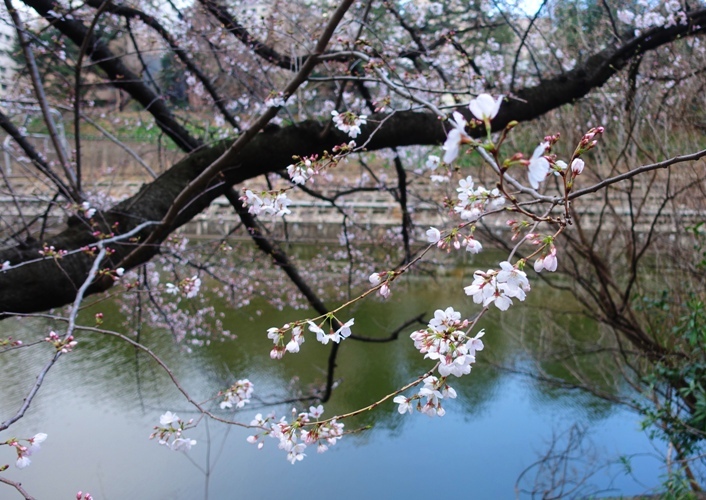 This cherry tree is near the new stadium that is being built for the 2020 Tokyo Olympics. 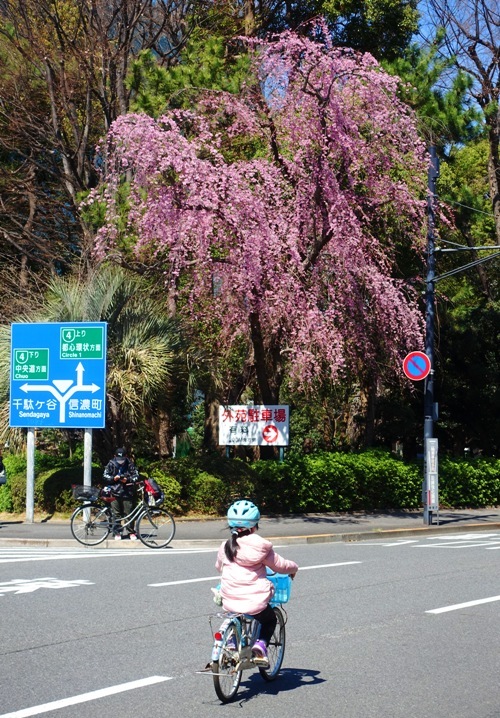 Capturing the young girl riding the bicycle in front of the tree was entirely by accident. However, it is a really cool picture. The pink of the coat and the purple shoes match well with the color of the blossoms on the tree. The trees in the foreground are just beginning to bloom and the ones in the background are a little further along. There are many different varieties of cherry trees in the large garden area, and some bloom a bit earlier than others. 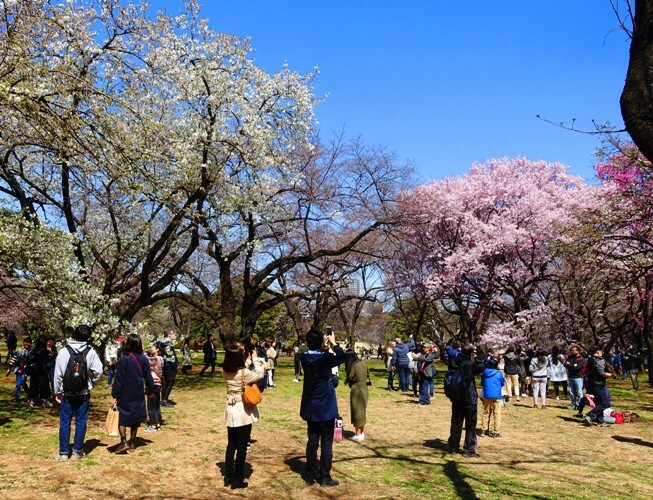 You can see here that many people are taking pictures of the cherry blossoms. People were using a wide range of devices from cell phones to professional grade cameras. A few people had up to five cameras they were taking pictures with. I took some with both my camera and my cell phone. I really like this picture. Can you see the reflection of the cherry blossoms in the pond? 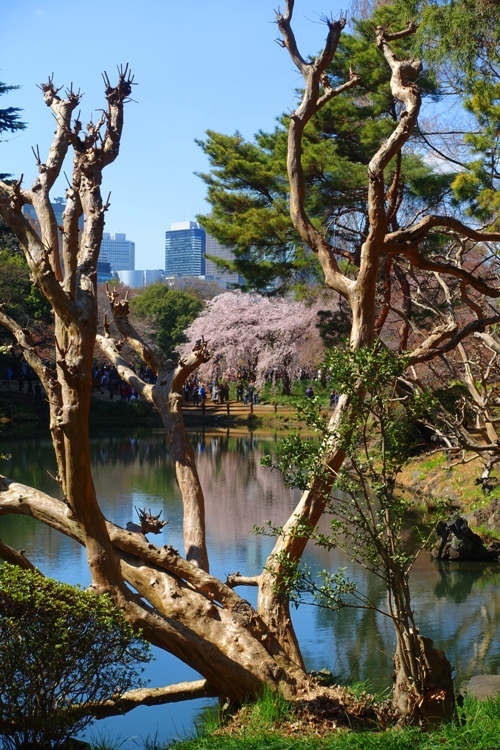 The Shinjuku-gyoen is a very pretty park and has many wonderful viewpoints. I also like this picture as you can see the modern buildings of the Shinjuku district in the background. The park is now on my list of places I want to go back to. I would like to see the park during different seasons, especially a bit later in the year for roses and in the autumn as the trees change color. Now for some sleep … hopefully…. 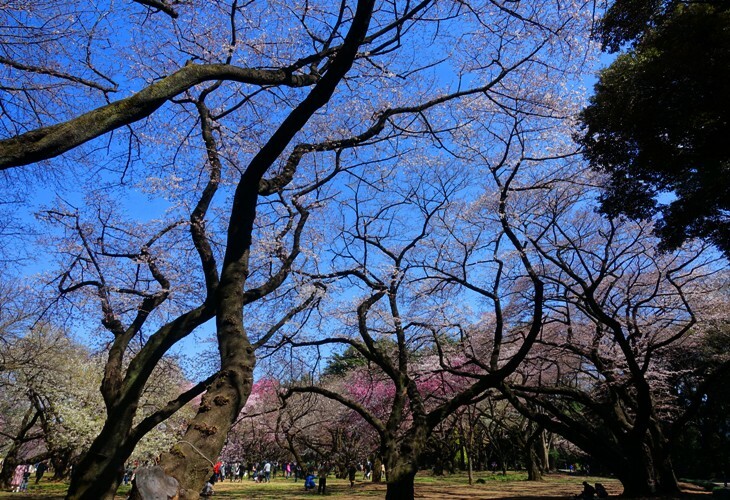 This entry was posted in Culture, Flowers, Japan, Nature, Seasons, Travel and tagged Blossoms, Cherry Blossoms, parks, Pink, Shinjuku-gyoen, Tokyo, Trees. Bookmark the permalink.